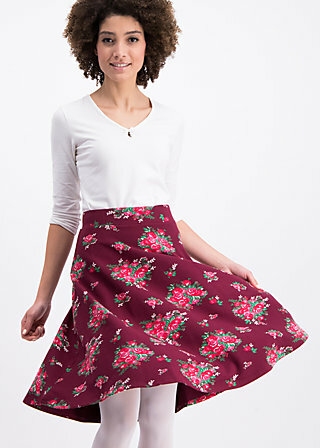 Feminine waist-level skirt made of endlessly comfortable cotton sweat, with a romantic-playful all-over print! A comfortable, versatile garment made of a thick and elastic sweatshirt fabric that has a good feel. Its length, which flows around the knees, the winter-soft material as well as the comfy, elastic waistband at waist level make this dream pattern in textile form the number 1 among all skirts. Its length is suitable for daily wear, and the flared bell shape guarantee both freedom of movement and a feminine look. In addition, a very special story is hidden behind colour 5 as we have revived a favourite pattern from the past! The fabric “flower-for-babushka” can be easily combined with those fabrics.